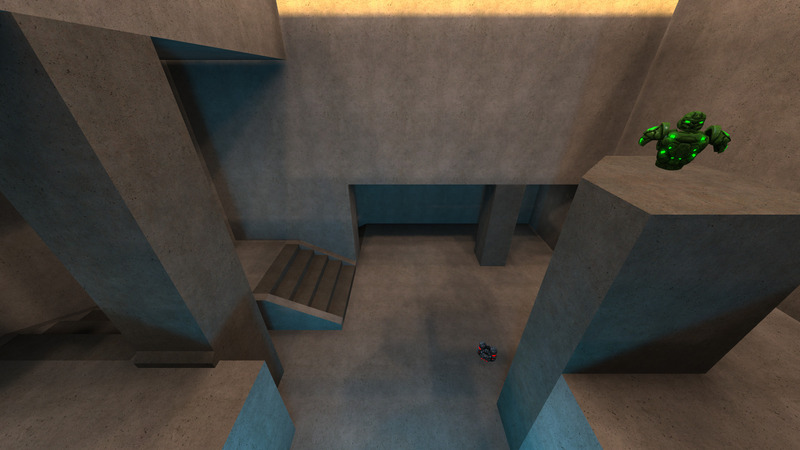 This is a duel map I've been working on for a while. It's still a work in progress, so any feedback is welcome. The map geometry is simple but looks effective. 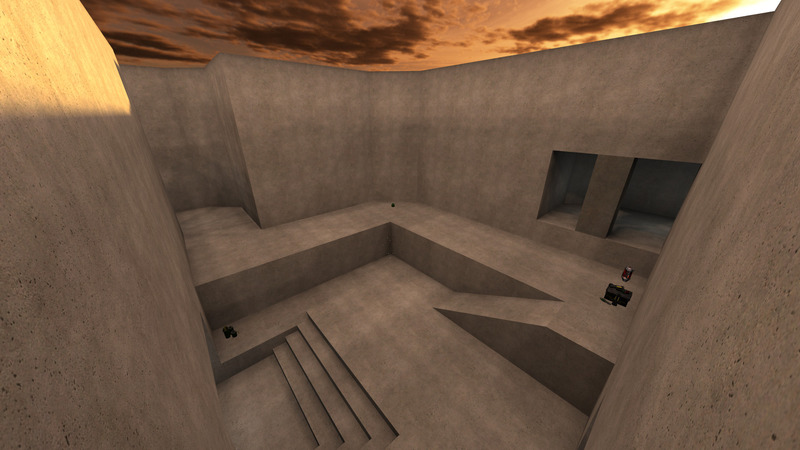 The map is available for playtesting on PsyX duel servers. So far i got nothing to complain about. It just needs some texture so you can orientate better. You're not the only one that's suggested I add some sort of trickjump to get to the armor. I'm on the fence about adding one, since the idea was to force the use of the blaster to get there. I hope this doesn't turn out to be an actual problem. I guess we'll find out once more games have been played on it. Maybe add a couple angled walls at some of the corners? So you can do 90 degree ricochets with mortar. EDIT: I agree with you on 100a, it's fine without a trickjump. The platform could be a bit higher though so it wouldn't be as easy to reach from the bottom level (25hp). Added a teleporter in the 50a room above the Mega Health, making the lower teleporter in the Mega Health room a two-way. Made one set of two-way teleporters glow red for easy identification. 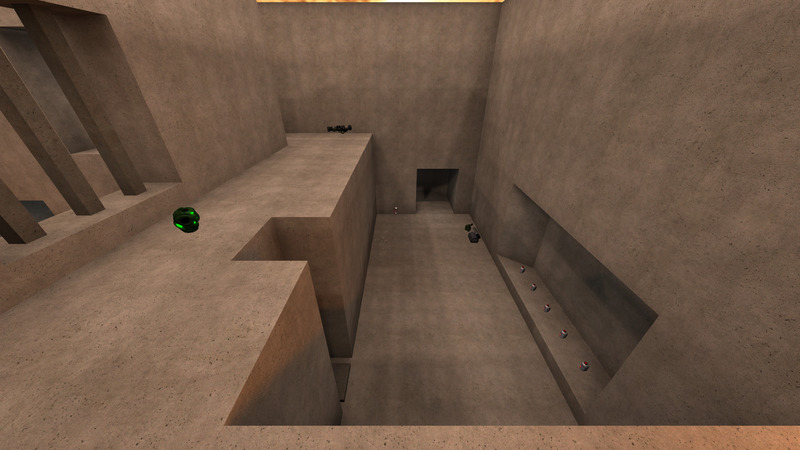 Added angled walls at some corners for mortar bounces. Added a small ramp jump to the Mega Armor. Made the side path to the Mega Armor slightly bigger. Changed the lower 50a to a 25a. Added a small ramp jump to the 25a. I would like to thank everyone that gave me feedback in-game and on IRC. Hi t0uYK8Ne, Just had a quick run around the map - the layout seems to be a good size for deuling or small DM games. In general I liked what I saw, however I'm not a fan of the Mega Health location, I prefer placing all Mega items in challenging locations - if you like that location, keep it there, it's your map. Thanks for the feedback munyul. I do really like the location for the Mega Health; before releasing b1 I never considered moving it. The only reason I started the map is because I had the idea for the room (the placement of the Mega Health was an important part of it) and wanted to see if I could make it look as good as I imagined. 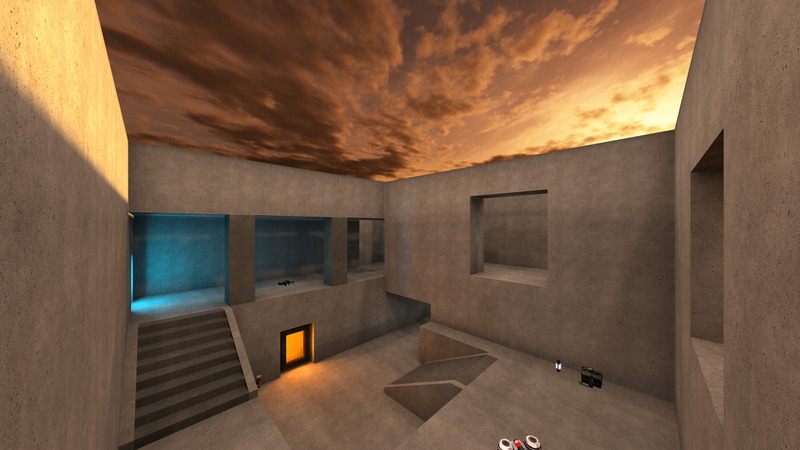 The rest of the map only exists because it felt incomplete. As for texturing, I'm not really sure what I will do, but I hope I can come up with something nice. Map walkthrough of graphite. Enjoy! Thanks for taking the time to make the video Antibody. I had the same concern about the distance between the two megas until I started looking at other duel maps. I found that most (if not all) maps with both megas have a similar situation.